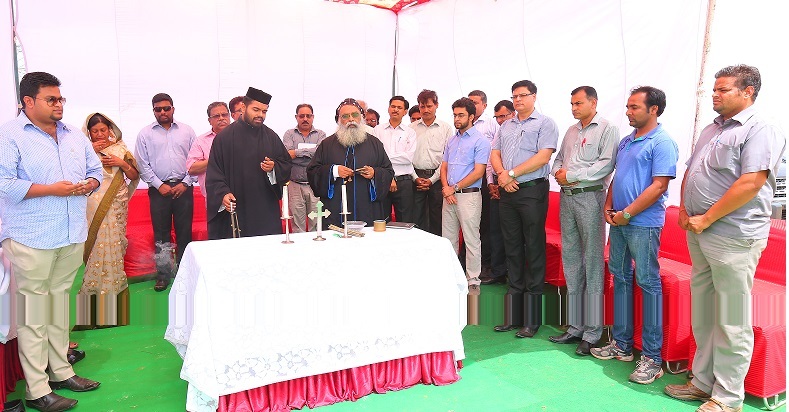 Bhoomi Pujan (Earth Breaking Ceremony) & commencement of civil construction for the project Transformer Factory and Associated Works at Kaharani Industrial Area, Bhiwadi, Rajasthan was done on Wednesday, 9 July 2014, at 10:30am. The function was conducted by Very Rev. M S Skariah Ramban, Diocesan Secretory- St. Basil Orthodox Church, assisted by Rev. Fr. Thomas Varghese. The products that will be manufactured at this new facility include EHV transformers upto 315MVA/400kV, Dry Type Distribution Transformers upto 5MVA 11/33kV, GIS & HGIS upto 220kV and Current and Voltage Transformers upto 220kV in the phase-1, whereas in phase-II, we shall have 765kV range of Power Transformers and Instrument Transformers. The ceremony witnessed heavy participation from employees of Skipper Electricals (India) Ltd. The team was led by Mr. Deepak Kashyap, COO – Skipper Electricals (India) Ltd. Mr. Siddhant Sachdeva, Executive Manager – Skipper t&d. along with Mr. Bisht, DVP-EPC and Mr. Anil Kumar Choudhary, Assistant Manager – Civil, who conducted the formal meeting thereafter.